Villa Santa Cruz is a magical place for a wedding. The four-room Villa was first just a tequila-fueled dream scribbled on a napkin until our friends and neighbors Matt & Jessica brought it to life. Now the beach-front boutique hotel in the arts town of Todos Santos is one of the's most popular secrets in Southern Baja. One of its many allures is the pristine, empty beach. 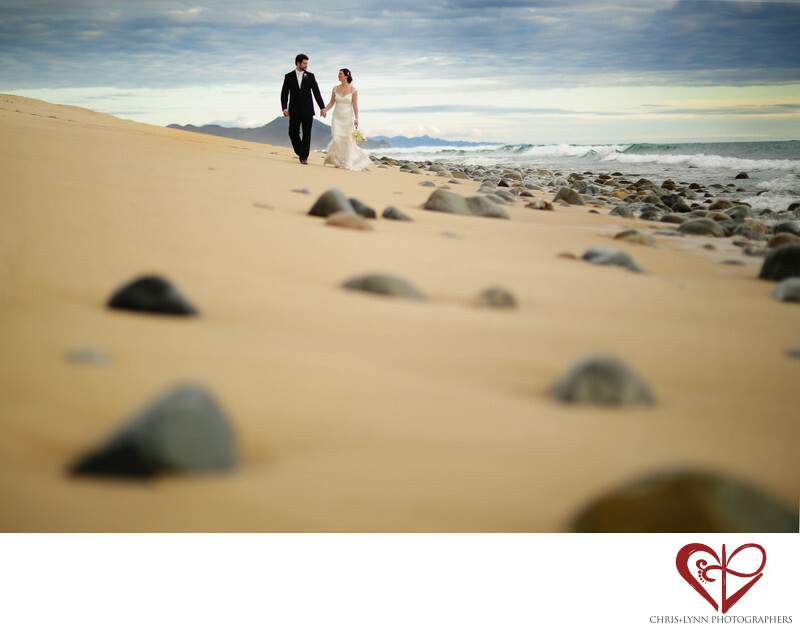 This image shows the happy couple just after their beach ceremony with Punta Lobos in the background, the rocks washed smooth by the ocean in the foreground, and the Waves of the Pacific ocean rolling in under a moody sky. The low angle offers a different perspective of the traditional beach shot. Location: Villa Santa Cruz, Camino a la Playitas s/n, La Pastora, Todos Santos, B.C.S., Mexico. 1/1600; f/1.4; ISO 100; 85.0 mm.